We already have flying robots. Robotic UAVs already dot the skies in considerable numbers for the military. But what about swimming ones? The Blackfish, a 10-foot long remote-controlled jet ski, is being tested by the Navy to defend wartime waters. Designed by British defense contractor Qinetiq, the Blackfish was developed to respond to small watercraft or swimmers who would otherwise get away from the Navy's big guns. 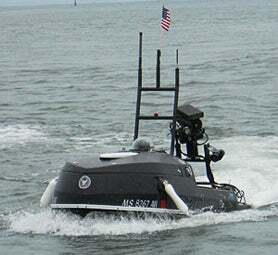 So this robot carries underwater sonar, surface radar and a video camera in order to monitor Navy harbors. That way, the operator running it from a mile away can alert the brass about what's going on. OR, if they ever decide to add weapons, shoot the threat out of the water. You can keep up with Kwame Opam, the author of this post, on Twitter or Facebook.